At the crack of dawn, trucks equipped with machinery and loaded with workers rolled beside the small enclave of homeless residents tucked underneath the 280 freeway, King St. entrance ramp. Driving the trucks were workers from Caltrans and the San Francisco Department of Public Works (DPW) with one goal in mind: expel the people living there, trash any refuse that may remain behind, and erect a sturdy $300,000 fence to prevent anyone else from gaining shelter there. The encampment had existed for years but on this morning the residents were forced to gather what they could and say goodbye to what they had called home for quite some time. As much as I would like to share my opinions about homeless topics and issues, I have to confess that I am not the best at dredging up raw emotions and putting them on the page. I add humor to take the edge off as a self-defense mechanism. (That’s way I wrote the book: Brain Sections) And since I know my lack in that area, but want to give the readers of this blog the fullest spectrum of the homeless experience, I reblog some really well written posts that catch me by the throat and that I know are 100% dead-on accurate. Many years ago thousands of people lived in the most horrifying of conditions in state hospitals throughout this country. Many, many people literally lost their lives to a system that justified oppression as being “for their own good.” Our response to this horror was 30 years ago to start the process of de-institutionalization. We were going to provide community based treatment and set people free to get a chance at the life they deserved. But we forgot about the treatment, we set very few really free and gave a whole generation of people a life that we would have never chosen for ourselves. I would add Borderline Personality Disorder to the list. It’s not really a mental illness though. — T.J.
Q: What got you into becoming a homeless advocate? Being homeless myself. Some of the service providers that I went to, I felt like I was second-class. I felt like no one cared. I’ve seen atrocities in shelters, people being belittled, degraded and it basically pissed me off. What can I do to change that attitude? So I started going to meetings. I heard about state meetings and then the Coalition for the Homeless, I’d go there and I’d bring my backpack with my life on my back and I’d go to these meetings and it gave me a chance to vent. But what I was saying was what I was experiencing and then at the end of the meeting they would say, “O.K. Now, shoo, shoo, be a nice boy and go back to whatever dumpster you came from,” and that’s the attitude I got from people. But I didn’t let that deter me, either. Because I’d show up at the next meeting and I’m still going to the meetings. A lot of people out there, they think they don’t have a voice. I’m just a messenger sometimes. I’ll ask people, “What you just told me— are you willing to come to a meeting and say that?” and they’ll say, “Oh, no! I can’t do that because I’m afraid that I’ll get retaliated against.” So I just carry that message. 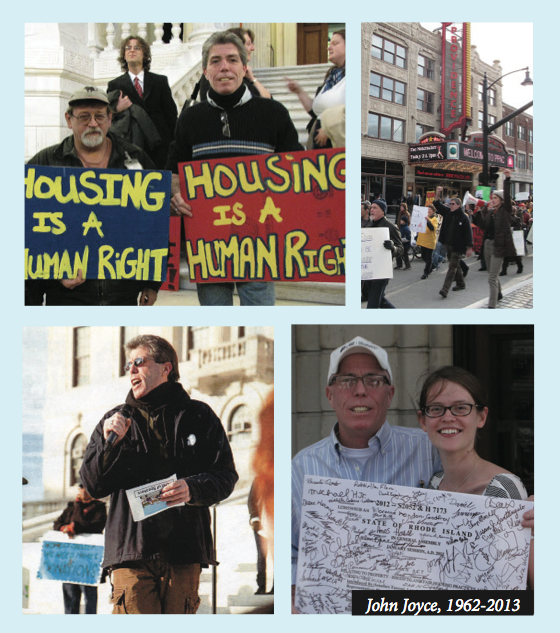 John Joyce (1962-2013) became an advocate for others after being homeless for a while. One of his accomplishments was to make Rhode Island the first state to enact a Homeless Bill of Rights. This interview took place last fall, when he was busily working while ill with cancer. Q: During the past session, the General Assembly passed a Homeless Bill of Rights into law. Could you explain what a “Homeless Bill of Rights” is, exactly? Check the Recent Posts section. Lots of good reading. — T.J.
Social Networks Matter a Whole Lot. I learned that most people end up homeless because their social networks have fallen apart due to a crisis or series of life events — or they never had solid family or friend structures to begin with. A good example is foster kids who age out of the system. Housing Goes to Those Who ‘Qualify’: I saw first hand how rental subsidies to the ‘cream of the crop’ because you need an income to pay rent, and most of the chronically homeless don’t have an income – or at least a steady income. So, agencies have budgets they can’t touch, and homeless clients they can’t help. The system is so convoluted. Today I got to witness a true act of kindness. And I mean the real, unadulterated act of kindness that warms the heart. And I can only be proud to say that I know the man who had the heart to do it. There are more homeless on our streets than most people are willing to say. Hell, I’m sure there are more homeless everywhere than anyone is willing to admit. And while I know not all homeless or disadvantaged were forced into it, there are definitely those who did not have a single choice in the matter. Today, as a friend and I were walking around the city we passed a man begging for money. My friend, without even hesitating, moved to give the man some money despite having very little change on his person. Medical science states that homelessness takes 20 years off a persons life. These pictures give you some idea that the statement is true. — T.J. I thought I would put together a slideshow of images of homelessness. Pictures are like film, they truly capture the reality of the situation, more than any serious documentary game or stunning graphics can.